"If you can imagine The Avalanches’ cut-and-paste sampledelica lost in rural Australia on some head-melting LSD, then you’re at least halfway to understanding the craziness that Melbourne’s Spoonbill has concocted” – Time Off. Propelled by the massive response from local and international audiences, and the successful release of his debut album Megafauna, Melbourne-based electronic producer Spoonbill lays his anticipated second album: Nestegg. Spoonbill’s latest call from the wild is both cerebral sonic entertainment and smoothly-beaten groove, coming together as a heavily edited fusion of live recorded instrumentation and fabricated electronica. From antique tones to genre-warping sound art, Nestegg is a mastery of chaos. 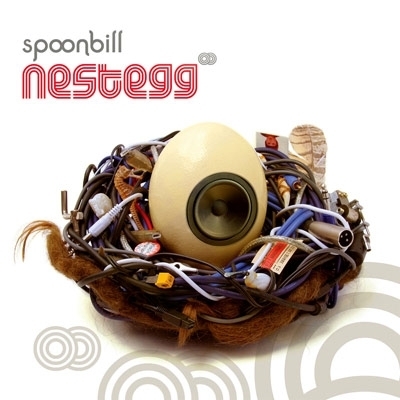 Enticing listeners with its smooth, shiny shell of downtempo tunes, Nestegg breaks open to reveal a thick and fast-flowing yolk of intricate beat chemistry. Within the nest is a selection of crafted recordings of premium Australian musicians such as Eden Altman, Bryson Mulholland and James Maguire, playing guitar, rhodes piano and double bass. Their performances captured in the studio are cut, twisted and reformed into new shapes, giving the Spoonbill sound its iconic collage aesthetic. During his recent migratory adventures, Spoonbill’s sounds have rocked crowds across Australia and in the US at renowned international festivals (Burningman, Nevada USA 2005; Symbiosis Festival, San Francisco, USA 2005 & 2006; Earthcore Global carnival 2006; Winter Solstice, Cairns 2006; Rainbow Serpent Festival 2007), supporting and performing alongside pioneering electronic producers such as Amon Tobin, Tipper, Kid Koala and OTT. Onstage, Spoonbill crafts an elegant and quirky symphony of honey-scented grooves, jovial humour and joyous beat trickery, melding an ever-evolving array of styles into a distinctive aussie blend. The Spoonbill live show often incorporates a flock of instrumentalists complimented by live, synchronised video projections. Behind the bill of the spoon is Jim Moynihan, an accomplished designer who has exhibited sound installation work in the Melbourne CBD (Nextwave Festival 2006), Federation Square (2004 State of Design Festival) and at satellites for the 2002 Tokyo and 2003 London Designers Block. He has been commissioned by ABC Radio National to produce several sound-art pieces and received funding support from The Australia Council For The Arts and Arts Victoria to record and produce this record. Drawing on such a colourful and dynamic history, Spoonbill is set to make 2007 a shell shattering year as his migratory path leads him around Australia and north, to Europe, North America and Canada. “Built upon a rich tapestry of uniquely Australian samples, Spoonbill has created a modern Australian masterpiece.” (InTheMix).